Joint Production Technology announced today that it has received our updated certificate to ISO-9001:2015 registration. Joint Production Technology’s quality system was assessed under the ISO-9000 2015 standards, a globally-recognized quality standard established by the International Organization of Standardization in Geneva, Switzerland and adopted by over 90 countries worldwide. Joint Production Technology’s quality system applies to the design, manufacture and repair of special cutting tools. Precision contract machining including CNC grinding, EDM, turning and milling based in Macomb, Michigan. 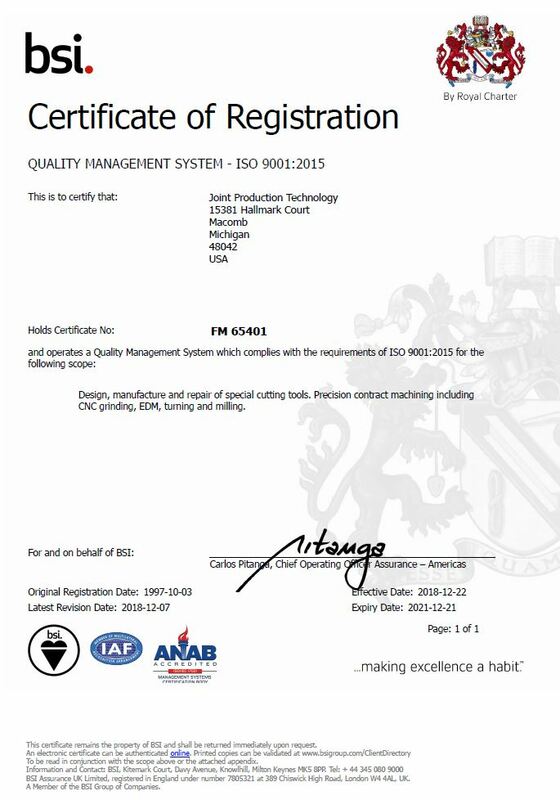 To achieve ISO-9001:2015 Registration, Joint Production Technology has demonstrated its commitment to quality standards and the continuous improvement of its quality system by achieving registration to ISO-9001:2015. 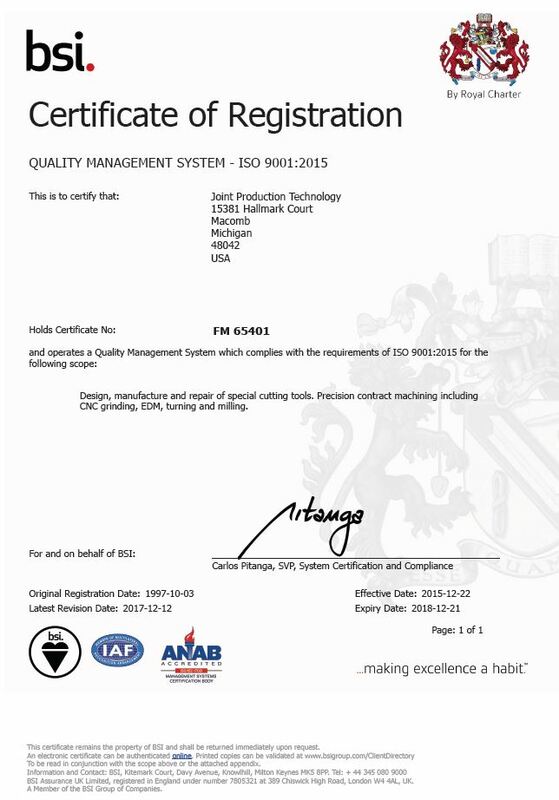 By applying for and achieving ISO-9001:2015 Registration, we let our customers and employees know that we aspire to an unsurpassed level of quality excellence. With BSI Quality Registrar, we have learned to recognize the value-added aspects of implementing ISO-9000:2015 in our organization. In addition to proclaiming a high standard of quality management, registration opens new markets for Joint Production Technology, such as Europe and Asia, where ISO quality has long been the de facto standard.